There's a certain order for most things, right? And when that order is out of whack, it causes a bit of confusion. Sometimes we're not even aware that there is an order until it is disrupted. Such as it is with Trader Joe's Popped Barbeque Ridges. Whoops, there, I did it again. 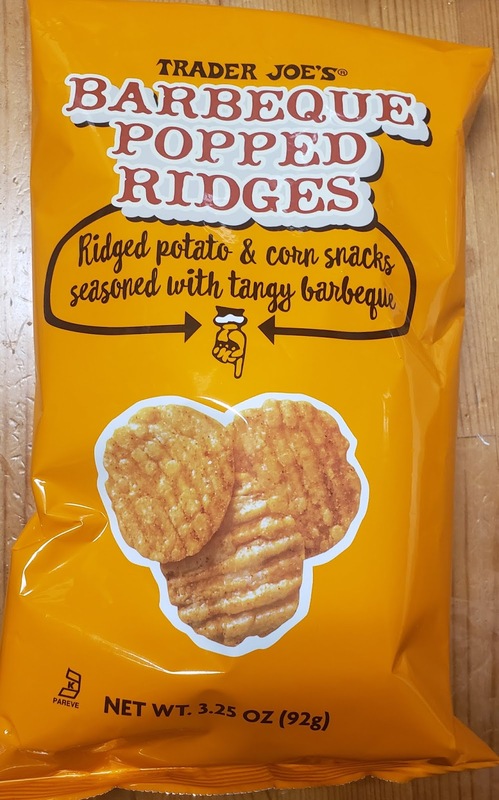 I mean Trader Joe's Barbeque Popped Ridges. See what I mean? Putting "Popped" first seems more natural, doesn't it? There's a natural order to adjectives in the English language, and while the name of this snacky TJ's new particular item isn't a textbook example (though a new particular snacky TJ's item could be), it brought this to mind. I keep wanting to put Popped first. But it's second. Maybe it's all so I can't refer to these chips as TJ's PBR and get some hipsters really confused. Anyways, the chips. I guess you can call them that, but as you can see, the packaging refrains from describing these snacks in that way. 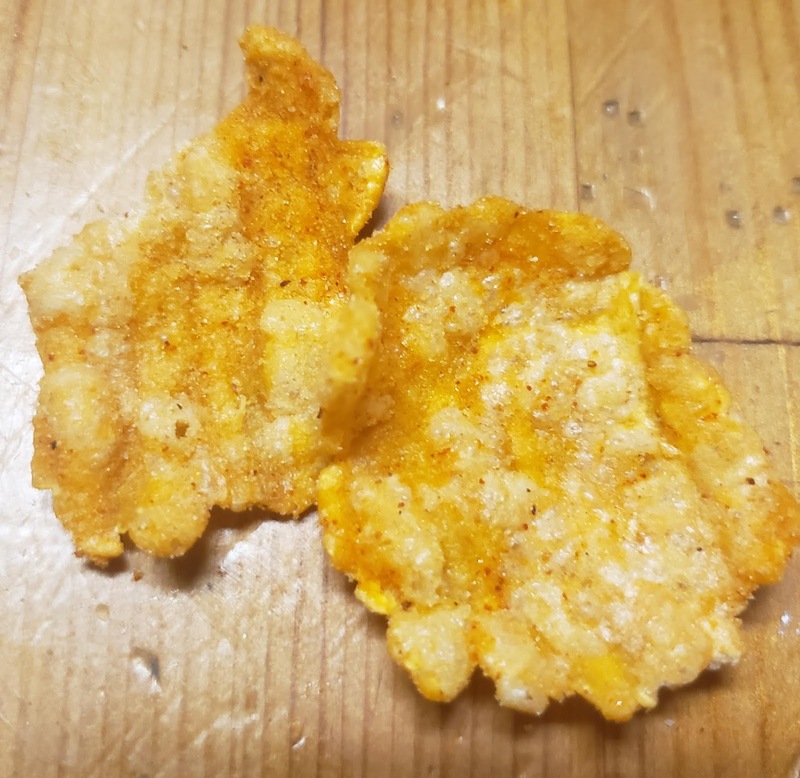 The texture and crunch of these ridges is more like potato stick mixed with corn chips with a little extra styrofoam. It's a little offputting and is my major demerit. I don't eat junk food like this all that often, so maybe there's other similar products out there that have the same kinda structure to them. I've had popped items before, though, but none of them struck me like this. Everything else is pretty on par. The barbeque seasoning is pretty representative - a little tangy, a little sweet, a little smoky, a little salty. Sandy described it as "cheap bbq flavoring" which is more or less accurate - TJ's went the tried-and-true route and didn't swing for the fences here. Not sure what else to really say about them. 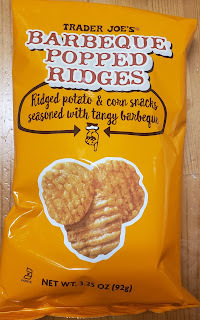 In all the popped ridge thingamabobs are okay, and aren't terribly pricey at less than $3 a bag. I can't see these being a new favorite, though. If these were 100% potato chip, they'd be unremarkable but fine. If they were 100% corn chip, it'd also work. But as a half-and-half conglomeration of crispy crunchy snacks, well, they're just odd. Kinda offputting. We're likely to finish the bag just fine, but it won't be in one sitting for sure. Not that bingeworthy. They are gluten free but that's likely not a huge surprise. Sandy musters them an uninspired three while I'll slide in half a spoon behind.